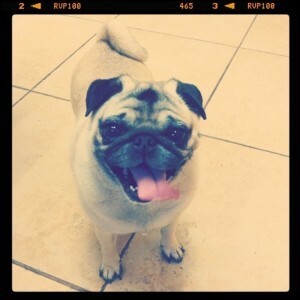 Molly is a 4 year old female fawn pug. She is a owner surrender due to the a surgery wound shoulder mass cyst/lump that would not heal for the previous family. They ran out of funds trying to heal it and thought she would be better off with us. She is good with kids, good with dogs but does not like cats. She is potty trained, super friendly and ready to give you lots of love! She will need her wound cleaned 2x a day with a wash, an antibiotic ointment and a supplement that can go in her food to help with healing. Soon she will be in tip top shape and feeling so much better! -Update from foster home. Molly is house trained and knows basic commands like “sit.” Molly is also kennel trained & sleeps in her kennel at night. Molly likes to play with her toys & is even trying to get the resident pug to play with her. She is good with other dogs & with children but does not like cats. She has a scab from her surgery that is very slow to heal. Molly will be on medical hold until PPN knows that the wound is healed. PS. I don[t like cats either!! Molly and I have something in common! There will NEVER be a cat in our house. EWE! !